The proposal for a new copyright Directive was originally aimed at modernising the copyright framework. However, it has fallen short of the initial expectations. Instead, the current proposal for the Directive text forces the implementation of upload filters and brings only minor improvements in other areas. In effect, the proposal could lead to unlawful restrictions on freedom of speech and reduce access to knowledge. Read below a brief summary of the most significant developments in the Copyright reform. After years of public consultations (see here and here), the European Commission published a disappointing proposal in September 2016. European Digital Rights analysed the text. Following months of intense debates and detailed analysis, the Report in the European Parliament lead Committee – Committee on Legal Affairs (JURI) – ignored key recommendations from the Committees on Internal Market and Consumer Protection (IMCO) and Civil Liberties (LIBE). By doing so, the JURI Committee missed the historic opportunity to bring a workable compromise on the table. Thanks to massive actions by civil society, the European Parliament denied JURI a mandate to negotiate the proposed text on behalf of the entire Parliament in the trilogues between the EU institutions. With JURI’s proposal threatening open internet and citizens’ right to freedom of expression, the text was sent back to the drawing board and was opened for re-drafting. The European Parliament ignored attempts from Members of the European Parliament (MEPs) Catherine Stihler, Julia Reda and Marietje Schaake to bring a better version to Article 13. After presenting a “reformed text” which contained implicit upload filters, the leading JURI Committee MEP Axel Voss managed to push the European Parliament (in plenary) to vote in favour of them. The new text was passed with a relatively small number of votes (366 for, 297 against). The European Parliament entered trilogues, the closed-door negotiations with the Council of the European Union, and the EU Commission. 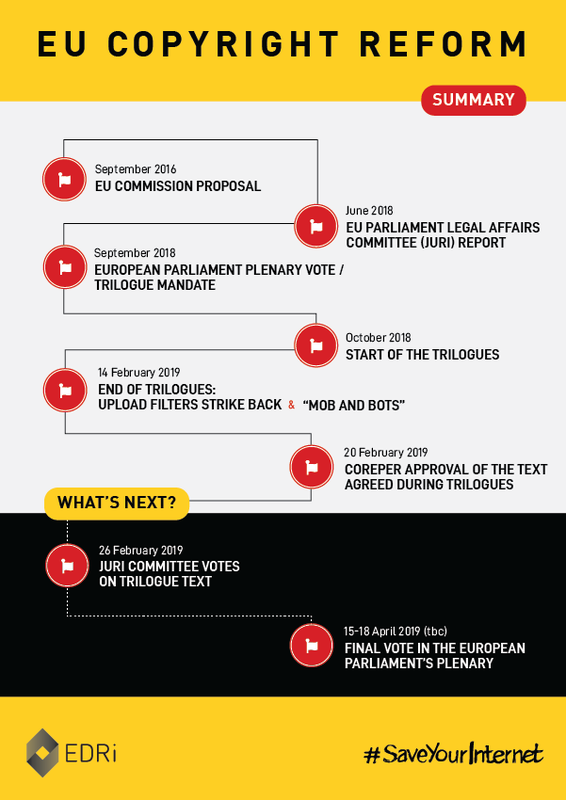 On 14 February 2019, the trilogue negotiations predictably concluded an agreement of the final copyright Directive text that included Article 13’s upload filters. The agreement echoed the position of the two most powerful states, France and Germany, supported by the music industry. The text largely ignored the concerns of the public, internet luminaries, the UN Special Rapporteur on Freedom of Expression, civil society organisations, programmers, and academics. The European Commission celebrated the trilogue text and called the adversaries to Article 13 and Article 11 “mob and bots”. The blog was harshly criticised, and thousands of people reacted by protests. The European Commission deleted the blogpost afterwards, justifying the deletion by saying that it had been “misunderstood”. The Committee of Permanent Representatives (COREPER 1) approved the text agreed during trilogues. It is expected that the JURI Committee will endorse the negotiated text in the trilogues. All 750 MEPs will vote on the entire Copyright Directive text. This will be a “Yes / No” vote. Do you want to stop the #CensorshipMachine? Join us and #SaveYourInternet!